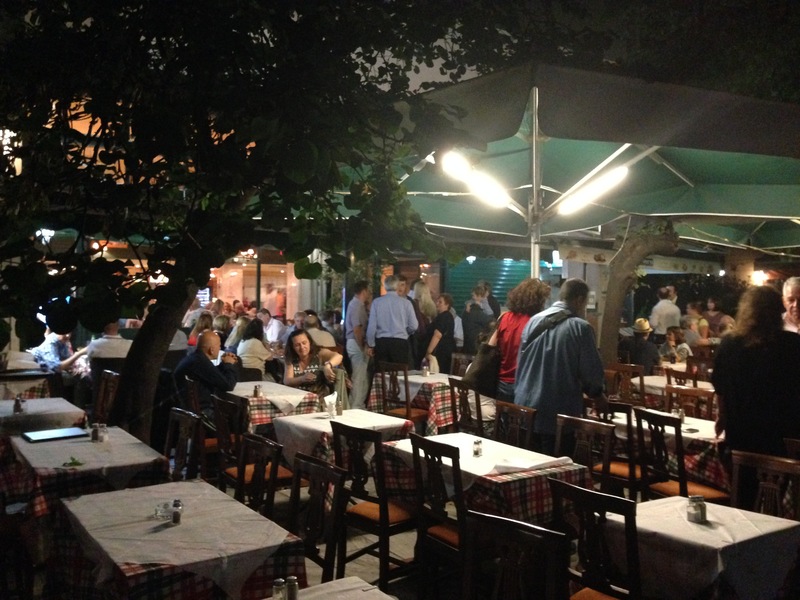 Cruising the Aegean – Day 8: Athens | Now, I'm Just Amused. After talking to the tour desk on board the ship, we were given a couple of passes that will allow us to walk off the ship here in Piraeus. Saturday morning, we had to be out of our staterooms by 8 AM, so we killed time reading by the pool until about 11 and headed for the pier and the taxi line. Our documentation told us it should cost about 20 Euro to get from the boat to the hotel and the first taxi we approached agreed and we jumped in. During the 30 minute ride, the driver told us about his family and how he would like to visit the US once his son finished med school. He was friendly and welcoming, as was just about everyone we’ve met on this trip. 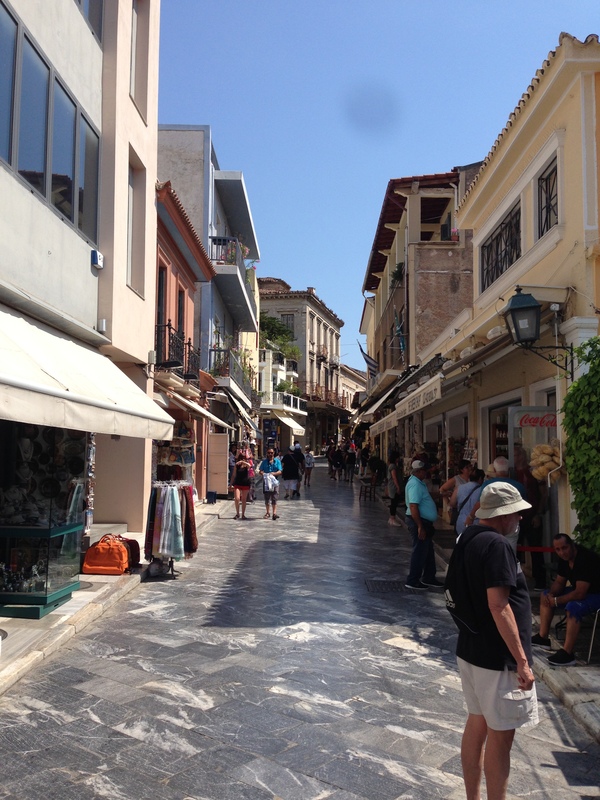 He dropped us in front of the Acropolis Select Hotel, where they had copies of all the vouchers I misplaced and warmly welcomed us. As the room wasn’t ready, we dropped our bags and hit the street. 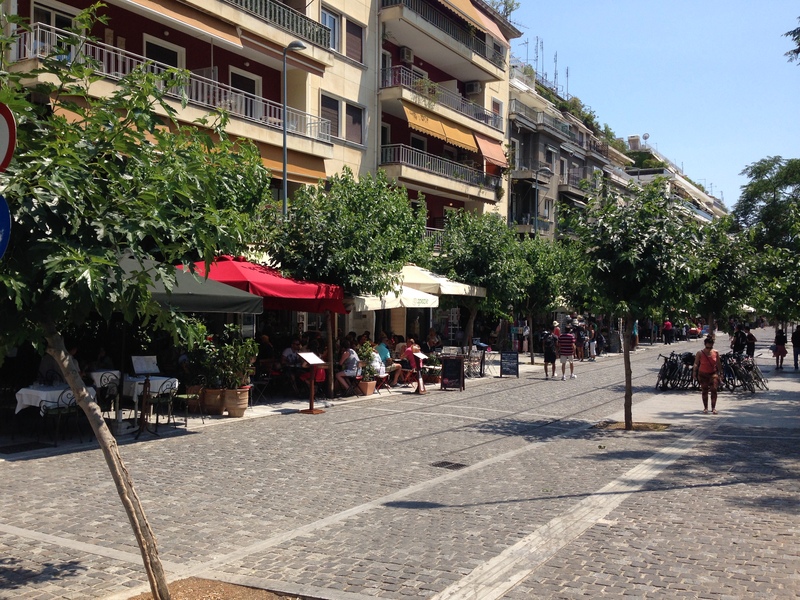 As we were in the heart of Athens’ old town, we were just steps from literally dozens of outdoor cafes. On the left, restaurants. Straight ahead, our hotel is about 200 yards up the street. 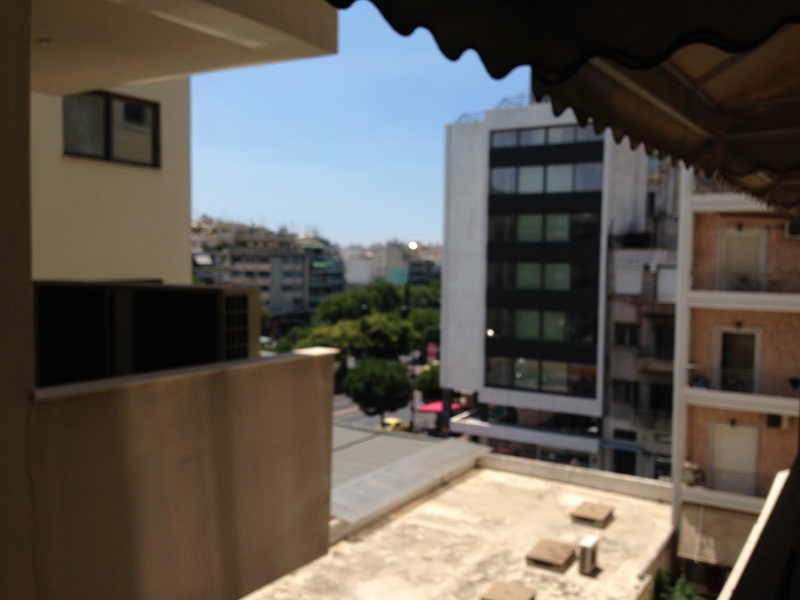 On the right, a subway entrance and the corner of the Acropolis Museum grounds. I’m not much of a salad guy, but this first Greek Salad at the Arkadia was life changing. Sooo good. 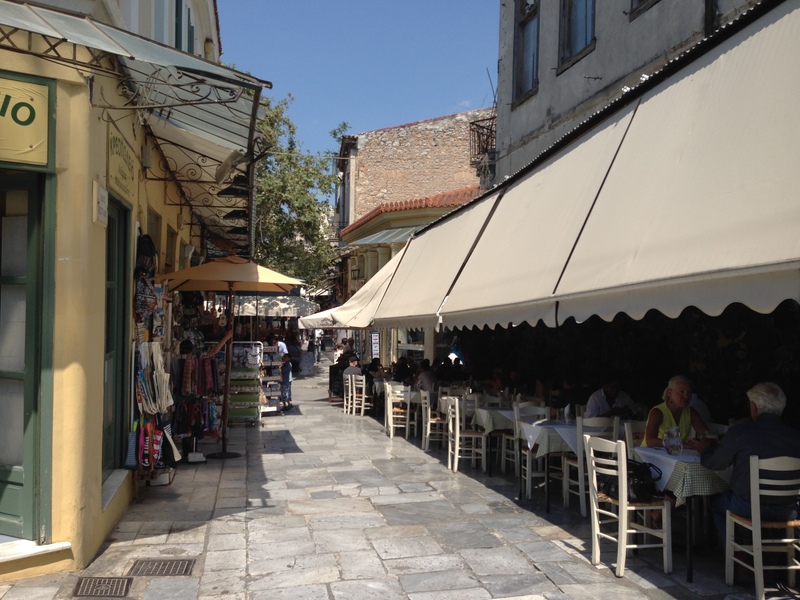 For the three days we were in Athens, we ate every lunch and dinner outdoors. 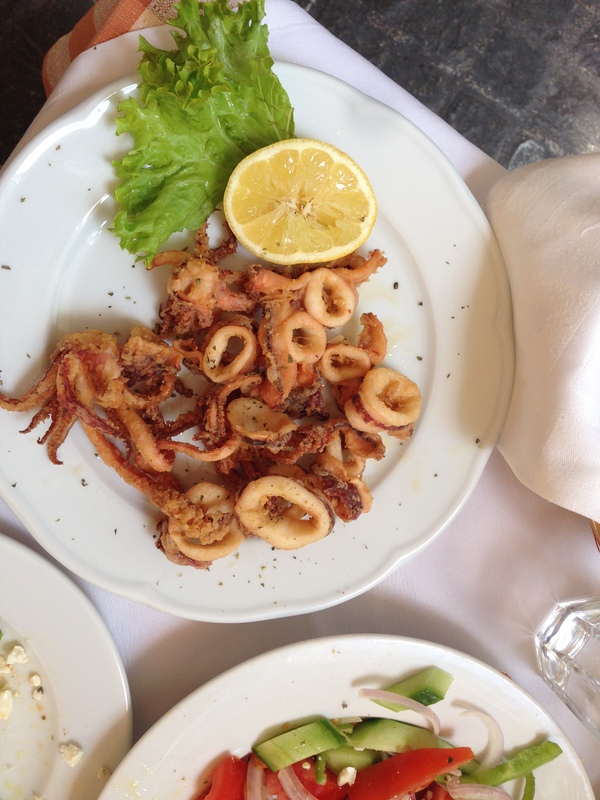 And every meal was started with a large Greek salad. 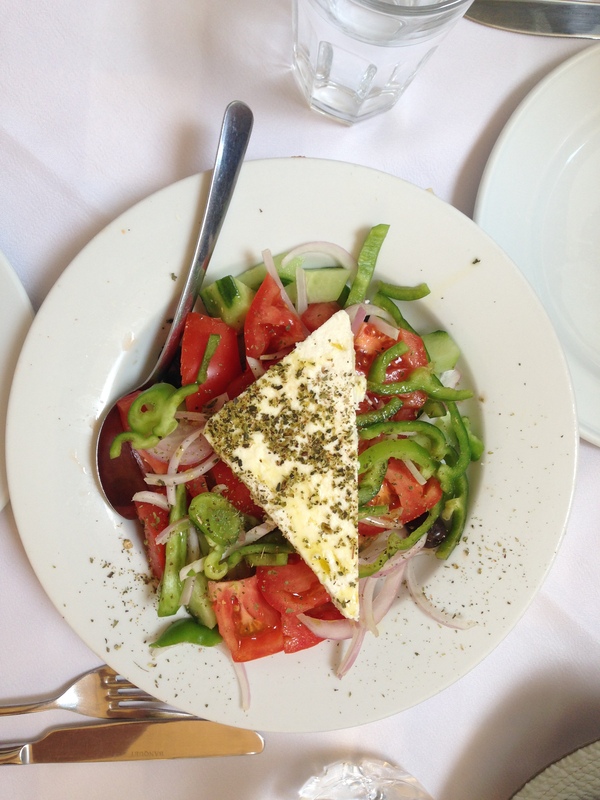 The tomatoes and feta were fresh and delicious and unlike anything you can get at home. I had heard Europeans complain about American vegetables and now I understand what they mean. 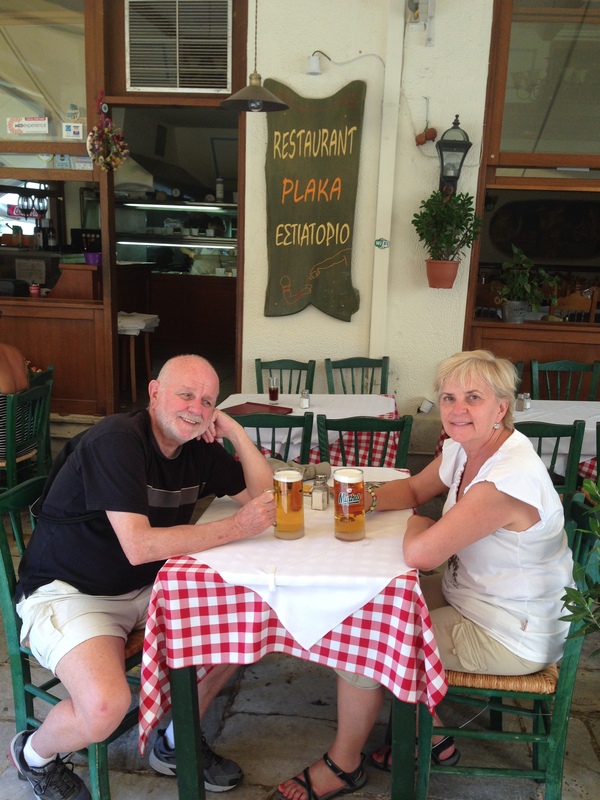 Beer here at the Plaka. Another beer someplace else. The weather was great. Between 70 and 80 degrees F, mostly. We were told that it had rained the entire previous week and we had lucked out. Yes. Yes, we have lucked out. It was very touristy, but lots of fun. Note the marble pavement. It must be wicked slippery in the rain. We walked up and down dozens of indistinguishable little side streets, until we were semi-lost and unsure of the direction home. But we learned a trick. This was our lodestar. 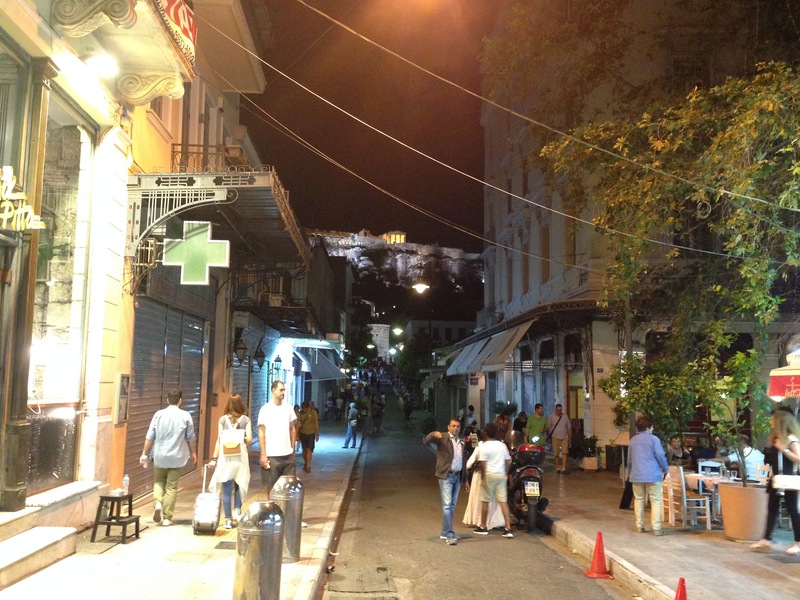 The Acropolis loomed over the area and at night, when it was lit up, it would lead you back to our neighborhood nestled at its foot. 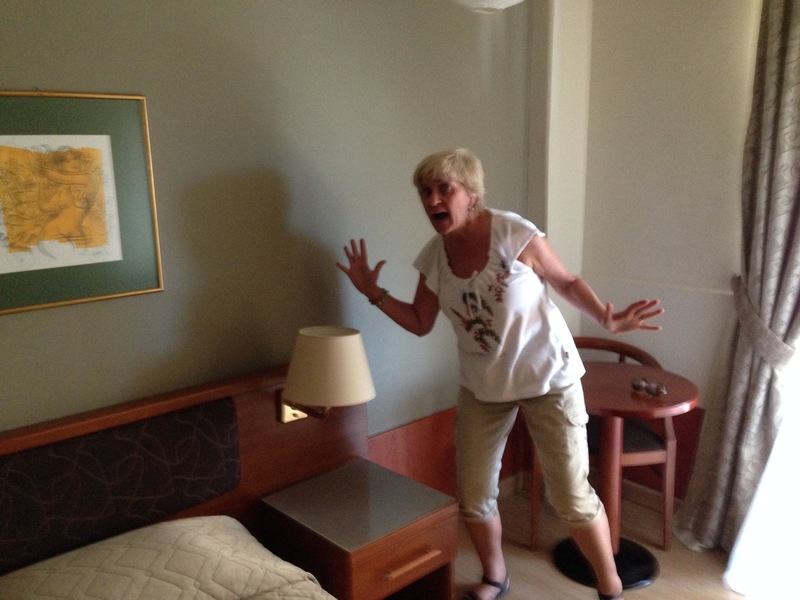 In mid afternoon, we headed back to our hotel to see if our room was ready. It was big (enough) and comfortable and modern. The view from the cramped balcony was pretty unimpressive. But hey! That’s Athens out there! The streets were alive with strollers. It reminded me of Seville or Barcelona in the way people stayed out late, walking, eating, visiting with friends. Lots of opportunity to people watch. 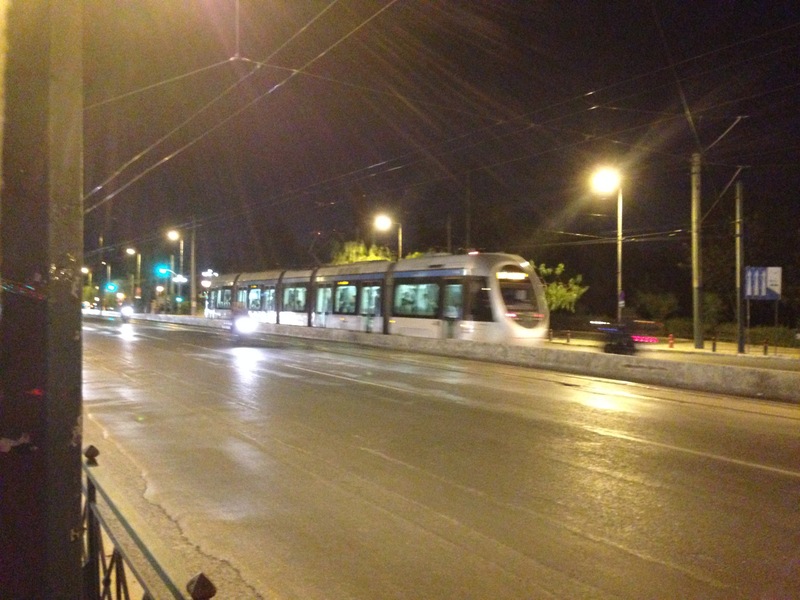 Trams! 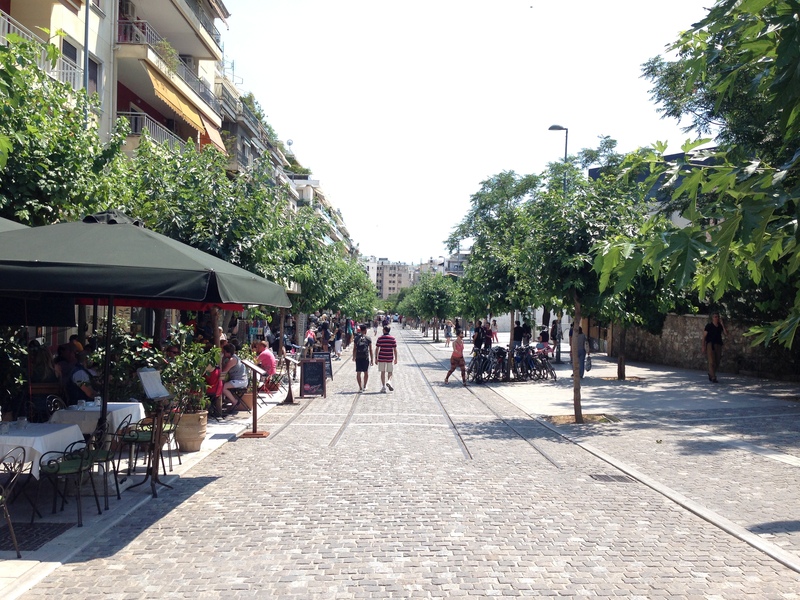 A reminder that there is a very modern Athens just a short ride away. 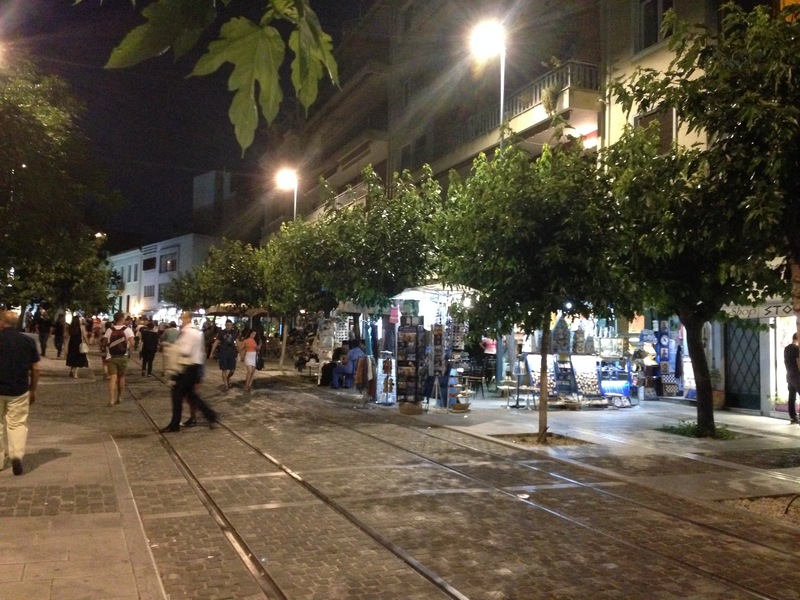 In the old town, the streets were full of life at 10PM. In the distance, up on the hill, you can see the Acropolis all lit up. Like a lighthouse, we used it to navigate the neighborhoods, day and night. A late dinner before we head back. 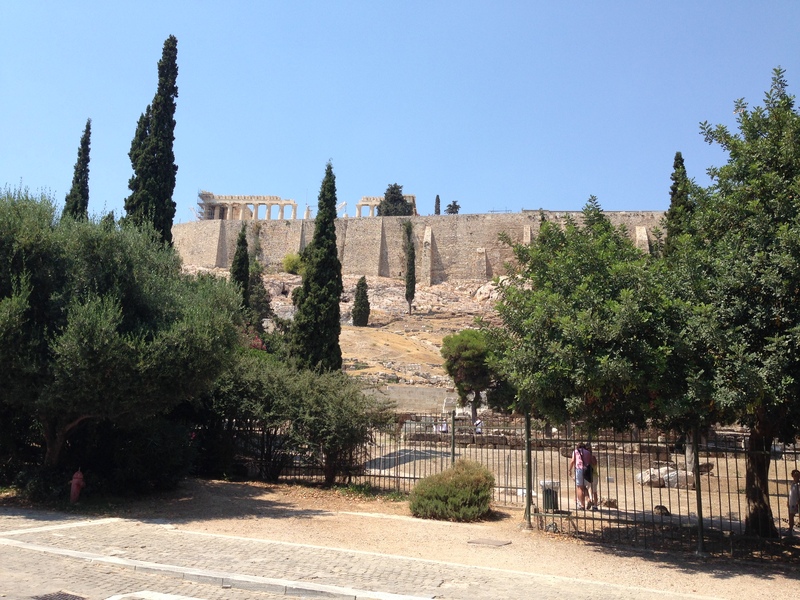 We have a tour of the Acropolis scheduled for tomorrow at 7:30AM. We should sleep well. As we leave, life goes on without us. 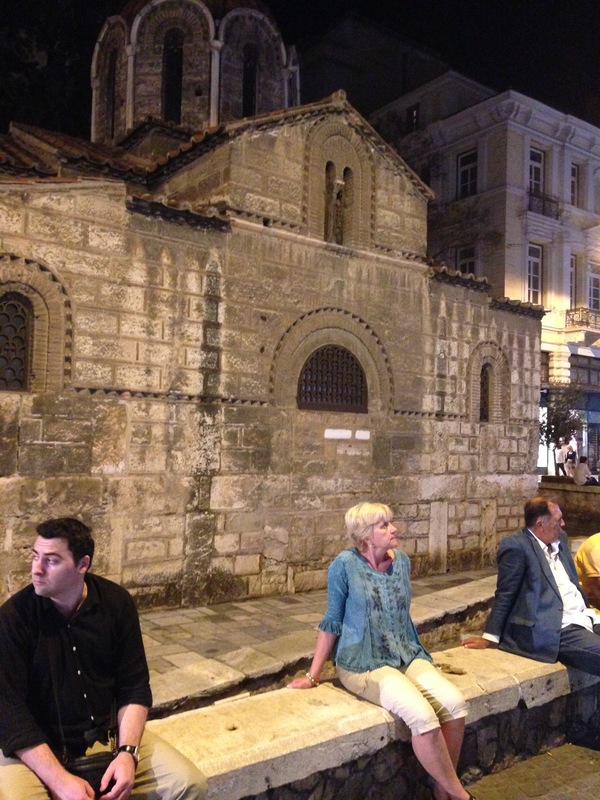 So far, we really like Athens. 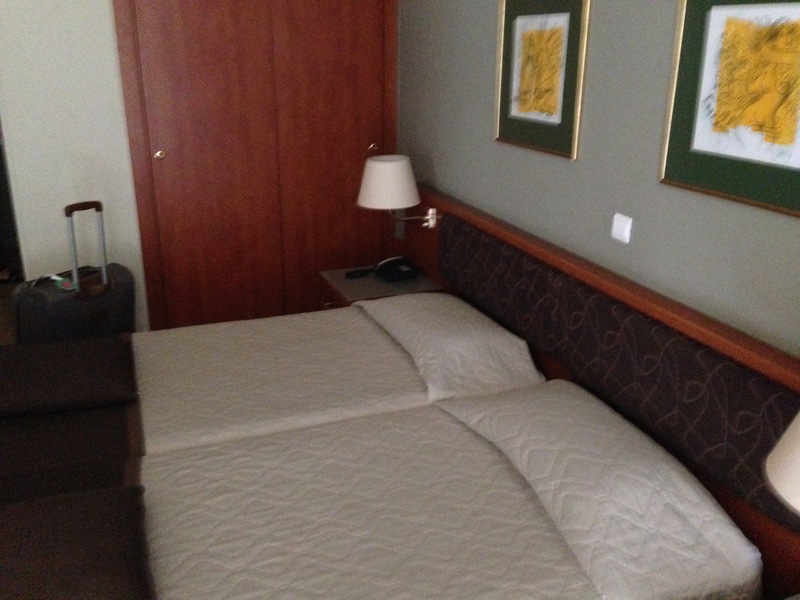 This entry was posted in Travel and tagged Acropolis, Aegean, Athens, Cruise, Greece, Parthenon, Royal Princess, travel. Bookmark the permalink. 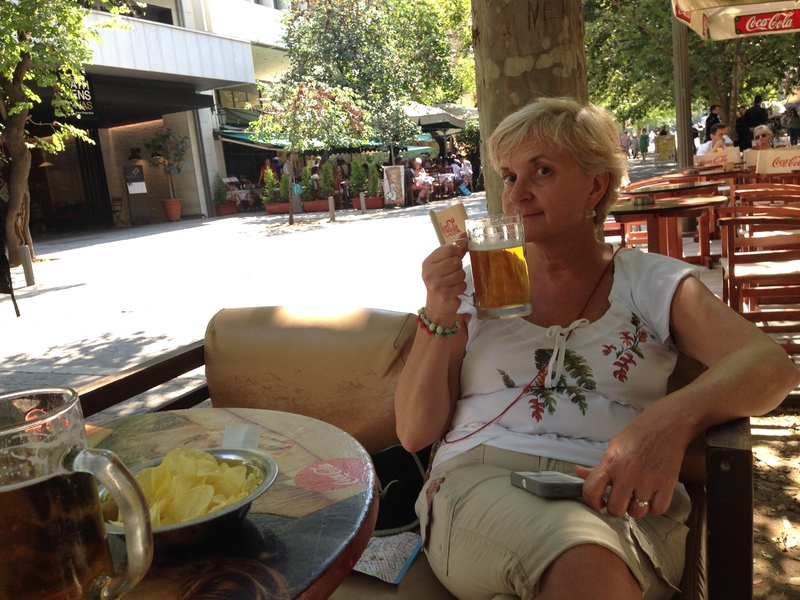 WOW fantastic narration and great photos too!…Move on Rick Steves you got competition!!!! 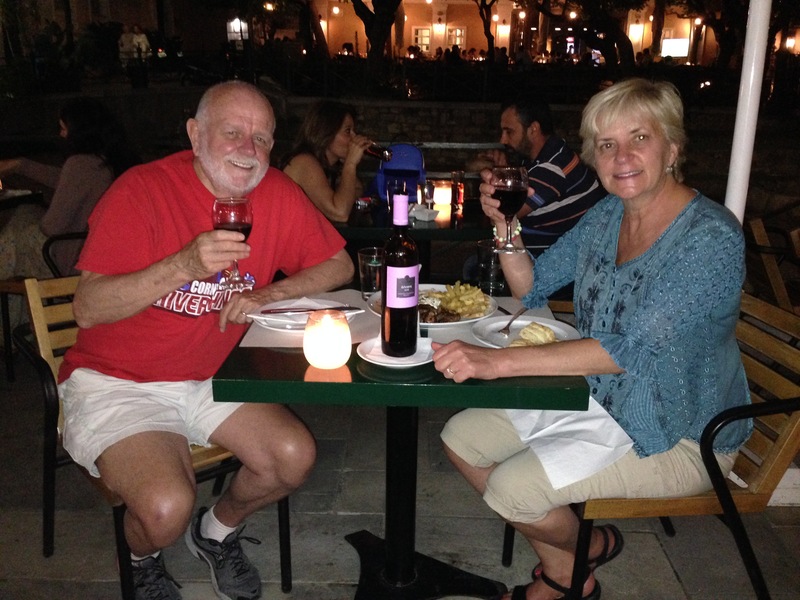 So glad you are enjoying everything..looks wonderful..I am enjoying the travelogue! !